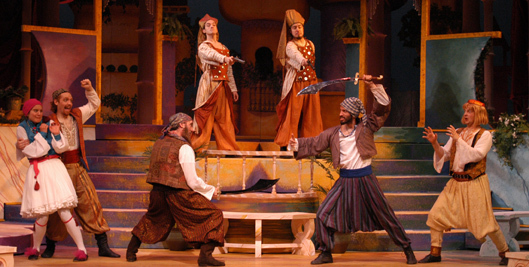 Illyria, which is based on Shakespeare’s comedy Twelfth Night or What You Will, is the ultimate mistaken identify musical. Set in the magical world of Illyria where Viola has been shipwrecked on this land’s shores, the young woman loses contact with her beloved brother, Sebastian, thinking he has been lost at sea in the wreck. The masquerade begins, as Viola becomes a young male page named Cesario who serves the Duke of Orsino. With that the tangle of romance, longing and love begins to simultaneously weave together and unravel. This musical comedy presents a classic triangle of love—handsome man (Duke of Orsino) who thinks he’s in love with one woman (Lady Olivia) while an “other” woman (Viola) falls in love with him. Illyria then turns the situation on its head as that “other” woman (Viola) is disguised as a young man (Cesario). Is that handsome man (Duke of Orsino) really in love with the woman (Lady Olivia) he believes he’s in love with or is he having “feelings” for that “other” woman (Viola) who he thinks is a man (Cesario)? That triangle is doubled in Illyria, which must truly be a mystical land with its power to engender passions and love, as Lady Olivia, who is supposed to be in love with the Duke of Orsino, finds herself enchanted by the young page Cesario who is really Viola! What is love? Where is love? Who is really in love? These and other revealing questions are answered in a stage musical that’s as wild as any farce and as romantic as any love story. There are two sides to this musical comedy. There’s the romantic aspect that at times is beautiful and other times sullenly soulful. Against the torch song emotions kindled by the love triangle multiplied by two is the story of the antic party pranksters, high jinx inclined comrades and shenanigan inducing trio of Sir Toby, Sir Andrew, and Maria. This tricky trio becomes a dynamic quartet when the party animal Feste joins them. These four musical comedy mischief-makers, with their marvelous machinations focused on Malvolio, add a combustive, gut-busting comedic energy spiced with a pinch of wry meanness, making life light, festive and frivolous. 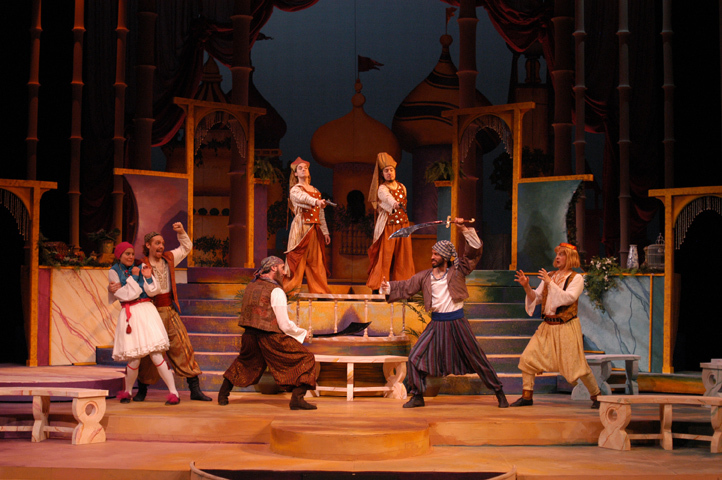 Illyria takes Shakespeare’s Twelfth Night and turns it into a stage musical that captures all the wonderment, illusion and emotion of a love story embellished with twists and turns that make love’s journey so unpredictable, melancholy and joyous. 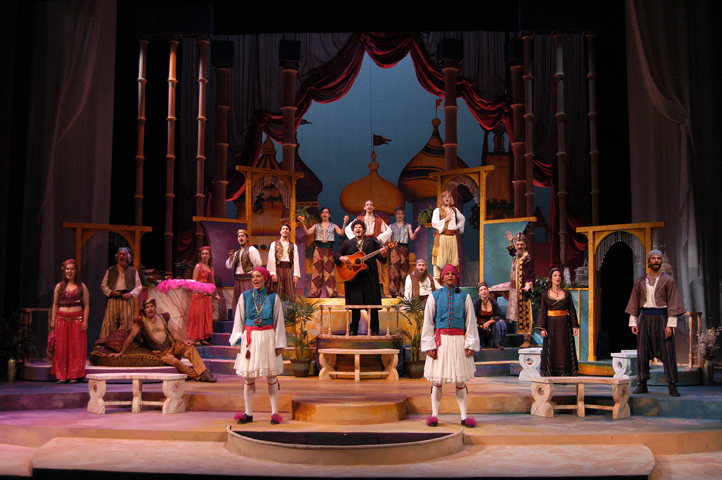 The musical comedy begins when Feste appears on the bow of a ship playing a guitar. He sings of a brother and sister, they are twins, traveling home on that vessel. But a storm washes over the ship and the twins are separated. The girl, Viola, is saved by the ship’s captain. The boy, Sebastian, is saved by Antonio who is also a sea captain. The two are separated and believe they have lost the other forever to the raging power of the ocean. Where are they? They find they are in the distant land of Illyria. When they ask who rules this land, their wrecked ship magically becomes the separate homes of Duke Orsino and Lady Olivia. Orsino sings of his love for Olivia, while she, being in mourning, sings why she cannot love him. The girl, Viola, dresses in her brother’s clothes and takes on the guise of a young man Cesario. She plans to work for the Duke. The boy, Sebastian, decides to have an audience with the Duke. Antonio, who despite the fact that he is wanted in Illyria, accompanies Sebastian. Upon meeting the Duke, Viola, who is pretending to be the young man Cesario, falls in love with him. However, Duke Orsino singing You’ve Never Loved enlists her to woo Olivia. The essence of raucous rambunctiousness, Toby, who is Olivia’s uncle, attempts to sweeten the comic plot of this stage musical by to convincing the rich dimwit, Andrew, to woo Olivia. To honor frivolity and induced insanity, he sings Let It Drink. When Viola/Cesario enters, Olivia instantly falls in love with the beautiful young man. In order to woo Olivia for Orsino, Viola sings Olivia. But then when Viola realizes Olivia has fallen in love with her, she sings There’s Something Wrong. Not to be left out of the ensuing debauchery and general drunkenness, Feste joins in the revelry of Toby singing Mistress Mine, creating a new bond that will develop into devilish mayhem later. Back at Orsino’s, the Duke is despondent, and he asks Feste to sing him a song. 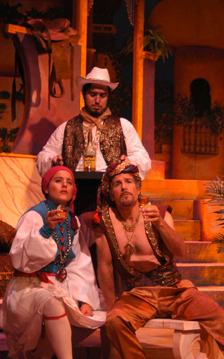 Feste sings Come Today Death, while Orsino and Viola/Cesario drown their respective sorrows with Lone Star Beer and tequila shooters. Viola/Cesario, who sings You Can’t Wait, tries to convince Orsino to let Olivia go. Instead, Orsino sends the lovesick Viola/Cesario to woo Olivia once again. Meanwhile, Sebastian arrives in Illyria. Depressed about then loss of his sister he sings Let Me Sleep. Olivia’s quick-witted servant, Maria, tricks Olivia’s steward, Malvolio, into believing that Olivia is deeply in love with him. A letter is planted by Maria and her conspirators, Toby, Andrew and Feste, that is designed to make the gullible Malvolio act like a buffoon in front of Olivia. Upon finding the faked letter he sings the comedic M.O.I.A. and goes off to prepare to woo Olivia. Singing Love’s Night Is Noon, Olivia confesses her love for Viola, and singing Paper And Quill Toby convinces Andrew to duel with Viola to win Olivia’s love. Viola encounters Andrew as Toby and Fabian sing Tango Of The Blades. Just when you think all comedic twists and turns have been navigated, Malvolio comes in to court a chagrined Olivia. As it is with all romantic musical comedies the various threads of love in the play start to unravel to be rewoven into the fabric of true love. But first, Malvolio must be put in place. He is imprisoned for showing his feelings for Olivia and sings the soulful Blues In The Dark. In a comic redemptive number, Feste, disguised as a preacher, sings Lord Have Mercy to the crestfallen Malvolio. By happenstance, Olivia meets Sebastian, they fall in love and venture to the preacher and marry, singing I Will Love You. Orsino arrives at Olivia’s, where he sees her offer Viola a friendly kiss. He first thinks she is Sebastian. But then, once Viola is reunited with her brother Sebastian, all becomes clear. Orsino makes Viola his betrothed, Olivia and Sebastian are one and all is well in Illyria, where love wins out. In the witty, wry guise of the musical Illyria, Twelfth Night, which is subtitled What You Will, is what audiences want. 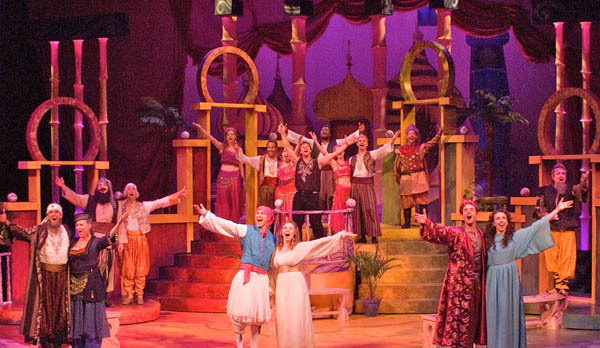 This is a nonstop musical comedy that celebrates passion, romance, love and lunacy. With beautifully crafted tunes, smart lyrics and combustible plot complications Illyria is an engaging, charming musical that will reconfirm your belief that true love does out. It all works out marvelously and happily. What else can you ask of a musical comedy? 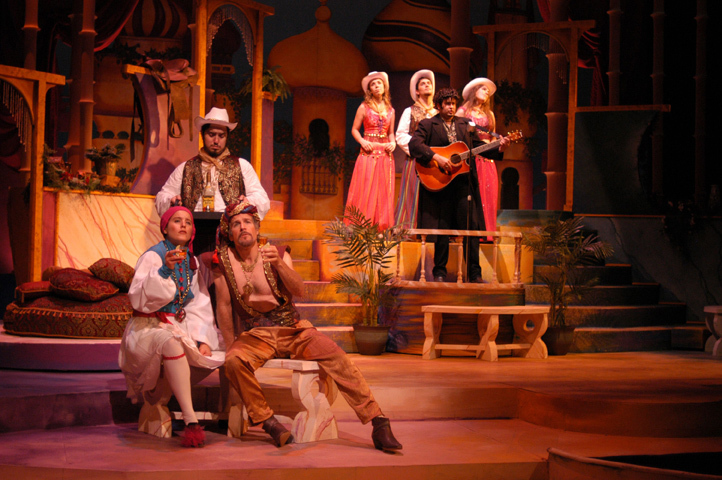 Illyria, which captures the romantic vitality and comic nuance of Shakespeare’s Twelfth Night or What You Will, is a beautiful, winning musical that’s prized by audiences. For more information on licensing and rights see our FAQs or to register and gain full access to Musical Bard fill in the form to your right. I attended one of the early performances of Illyria (early June). it was FANTASTIC! the music is addictive (love, love, love it!) and the adaptation is brilliant. my only regret: i could not extend my stay so i attend another performance. i liked it so much i am planning a trip back to Atlanta (from central Florida) so i can see it again. Illyria should be on broadway. why isn't it??? ?